2015 Topps Inception Football arrives Wednesday at Sports Cards Plus as Topps first 2015 football release to feature Jameis Winston, Marcus Mariota and the rest of the 2015 draft class in their NFL uniforms. 2015 Inception Football focuses on autographed rookie cards. Each one pack box has seven cards: Two autographs or autographed memorabilia cards, a jumbo relic, two base cards and two parallels. The 100 card all-veteran base set had eight parallels: Green are one per box, Purple and Magenta are #d/99, Red #d/75, Orange #d/50, Blue #d/25 and Printing Plates and Diamond Parallels are 1/1. A total of 44 rookies have on-card autographs with parallels matching the numbering of the veteran parallels. Inception Silver Signings #d/50 feature rookie signatures in silver in on a dark background, similar to Bowman Black Collection inserts in baseball. A Gold parallel #d/25 is in gold ink. Further Gold versions bring in Nicknames #d/10, Inscriptions #d 1/1, and QB Playbook #d 1/1 which has a play diagrammed on it. QB Inception Autographs #d/20 are dedicated to the quarterbacks at the 2015 NFLPA Rookie Premiere and include Winston, Mariota, Bryce Petty, Sean Mannion and Brett Hundley. Inception Football includes Quad Autos #d/25 and a Six #d/10 Rookie Autographs done in a book card format. Forty rookies have Inception Autographed Jumbo Patches which included patches from jerseys worn at the Rookie Premiere. Parallels come with multi-color swatches and are serial numbered. 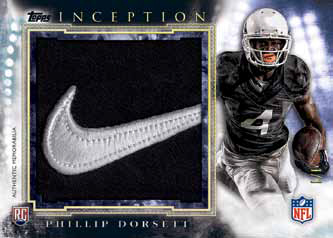 One-of-One Blue versions come with a Nike Swoosh and Diamond #d /1/1 parallels have team logos. Orange parallels #d/10 use pieces of gloves. Inception Autograph Patch Books #d/5 have a Jumbo Patch on one side. Other Book Cards include a Laundry Tag #d/5, Jersey Letters #d 1/1 and NFL Shield Logo #d 1/1. So go to Sports Cards Plus on Wednesday and pick your box from The BEST CASES in The Hobby at The LOWEST Price in The Galaxy (all of Texas). Don't be the guy who says, "That could have been my picture."